Forums at Modded Mustangs > TECH Exchange > Articles - Body > Retrofitting Morimoto Mini HID projectors into New Edge Headlights, the easy way. 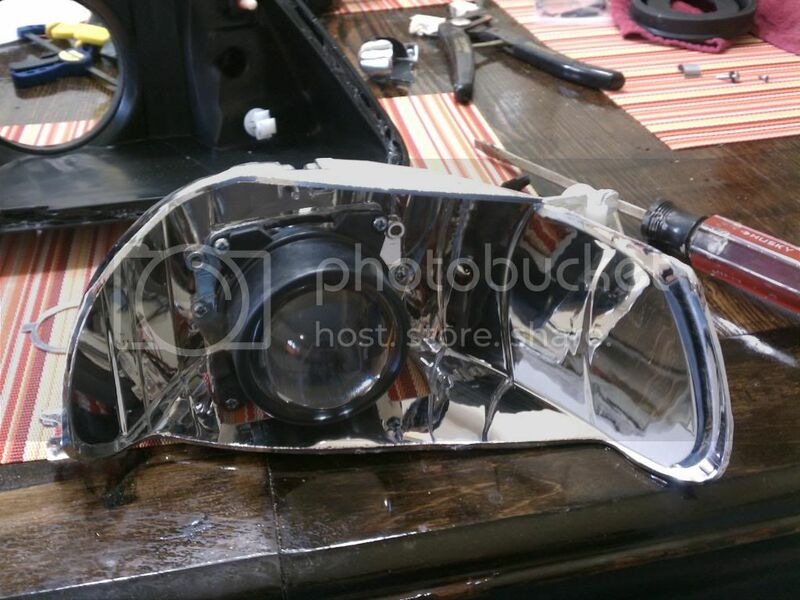 Retrofitting Morimoto Mini HID projectors into New Edge Headlights, the easy way. scattered it is all but unusable. "Ricer" projector housings are not too bad with the recommended halogen bulbs in them. "Ricer" projector housings are better with HID bulbs in them. But if you want the best light output possible, bright, usable, and non-blinding to other cars on the road, you can’t beat a decent set of HID specific projectors swapped into a set of our stock housings. First is stock housings with 9007 HID bulbs swapped in. note all the light that is going up. This does you no good and in fact is blinding oncoming drivers. Yea, I’m sure you aimed yours down a bit more to compensate, but really what is that doing for you? Nothing. It is simply wasting light, and creating a dangerous environment for oncoming drivers. Next up is the aftermarket housings with halogen projectors in them with the proper halogen bulbs. Not too bad, but the cut off is blurry. Good thing is that you are not going to be blinding oncoming drivers and you can aim them properly. 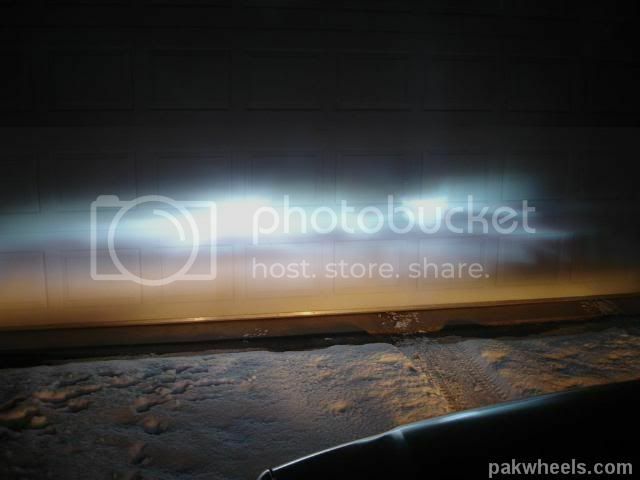 I have a set of these, but I swapped a set of low beam projectors from an Acura TL into them. Not going to do that again, as it was a PAIN!! now we have the final product.... HID bulbs in projectors that were designed for them. 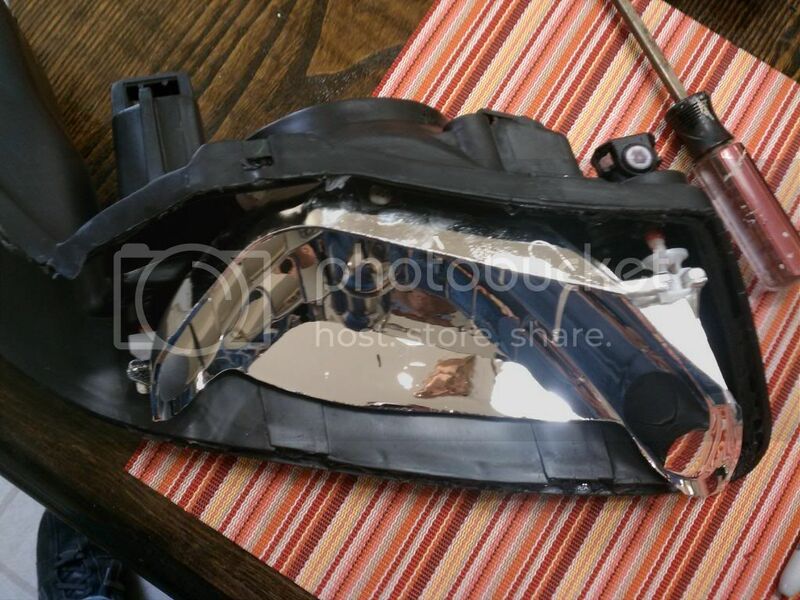 The reflector bulb had been shaped for the HID bulbs position and shape of the arc in the salt bubble, the shields are optimized for the HID's and, well I will let the picture speak for itself. 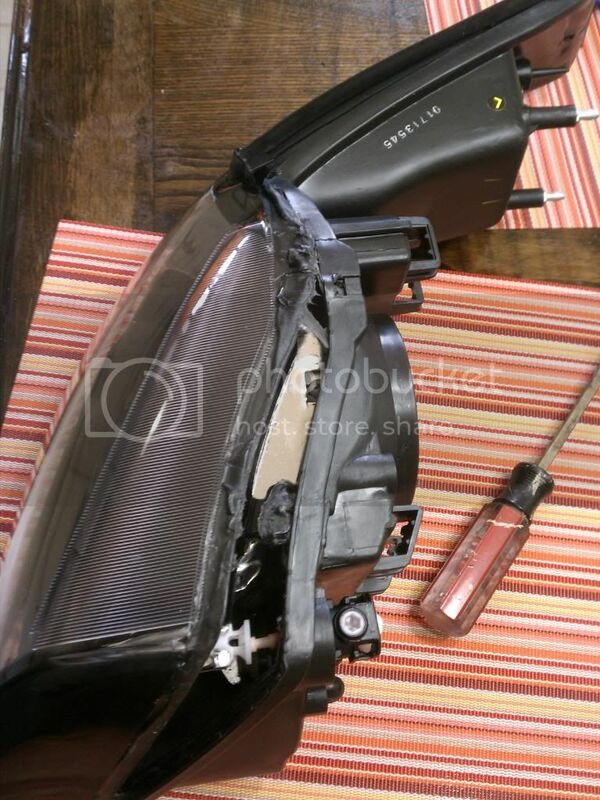 Here is a quick shot of the output from My 02 GT after the conversion…. Notice the nice flat even cutoff? See how no light is going above the cut and shining into oncoming drivers eyes? Well let’s get into how I did this. Approximately 2 hours per side. Set the Oven for 150. I have heard some people use 175 to 200, but when I did my Cobra Tails at 175 they lenses got warped. So I play it safe now and use 150. It gets the job done. As the oven is heating up prep your housings. 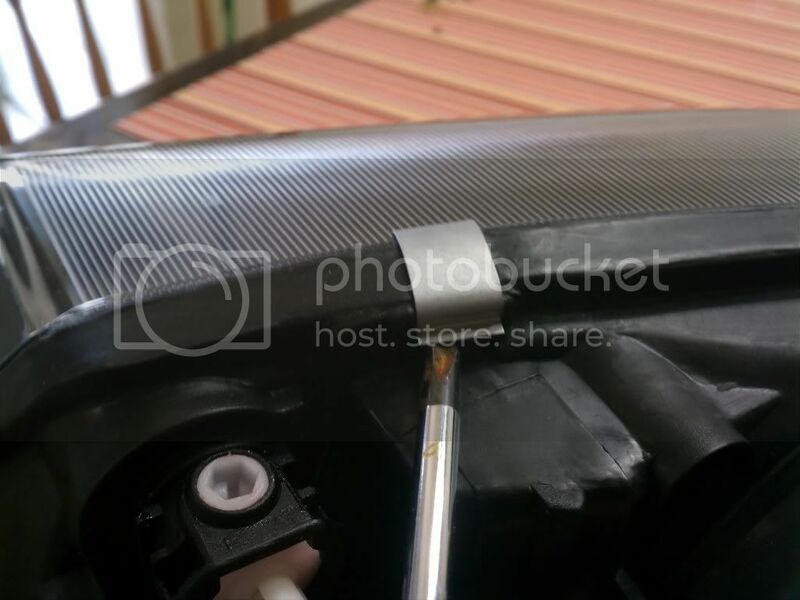 There is normally a combination of 1 or 2 screws and a metal clip holding them together as well as the Butyl glue. Note that the first screw attached the lens to the backing of the housing. 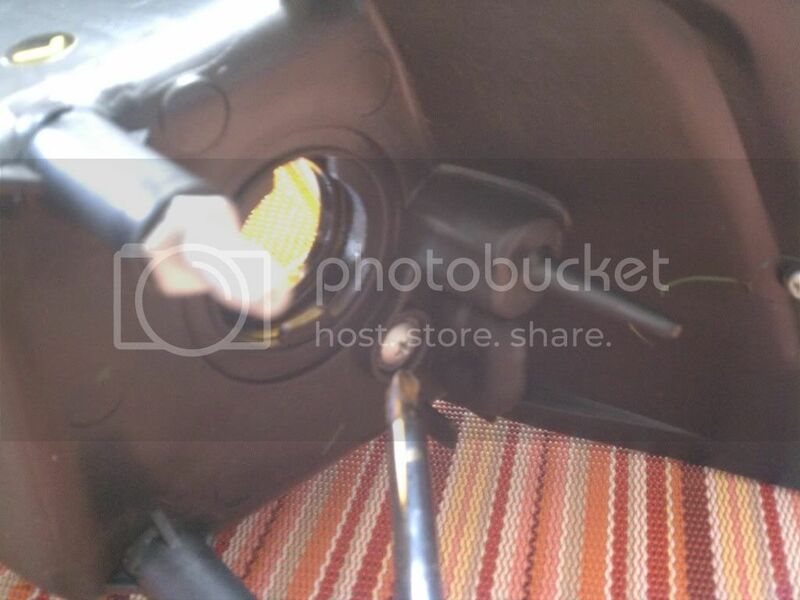 The second screw is used to hold the turn signal bulb pocket tight to the back of the housing. Once the light has baked for 5 minutes take it out and start prying it open with the flat blade screwdrivers. Go slow and be gentle. The plastic will be a little soft and if you crank on the prying you will mar up the plastic a lot. I normally start at the interior upper corner and work from there. 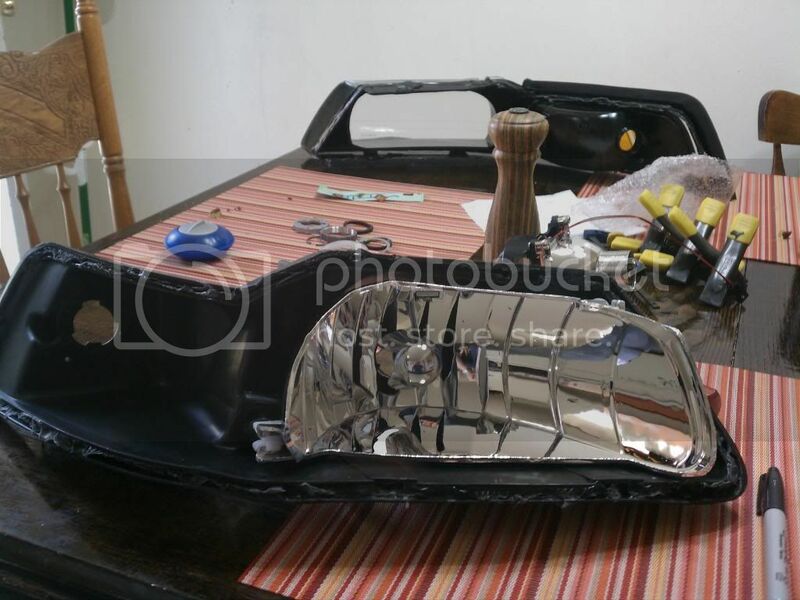 Ok, now that you have the lens and inner molding off set those aside as we need to get the reflector bowl out of the housing. There are ball and socket style clips on three corners. The inner lower one is a rigid non-moveable mount and is used as a pivot for the adjusting of the light when aiming. The inner upper is your vertical adjustment and the outer lower mount is the horizontal adjustment. Now that it’s taken out, the fun parts begin. 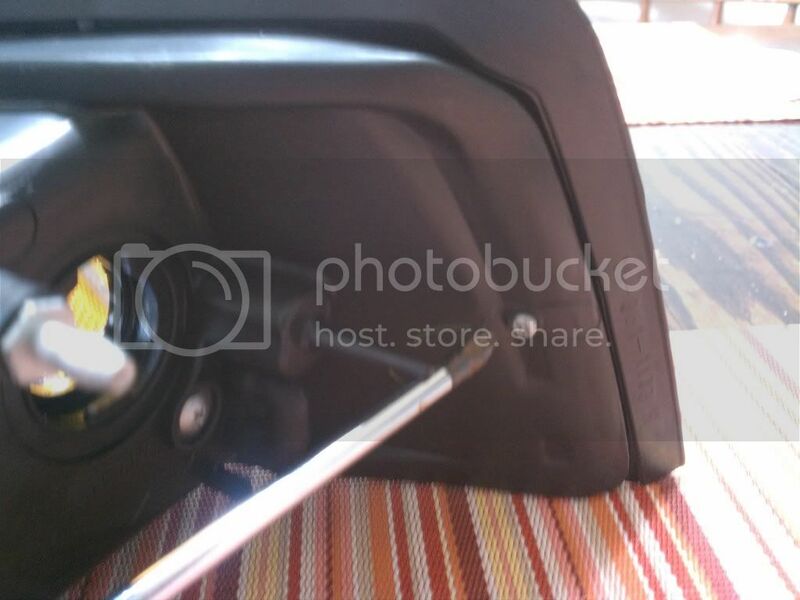 Remove the screw that is holding in the bulb tip shield. 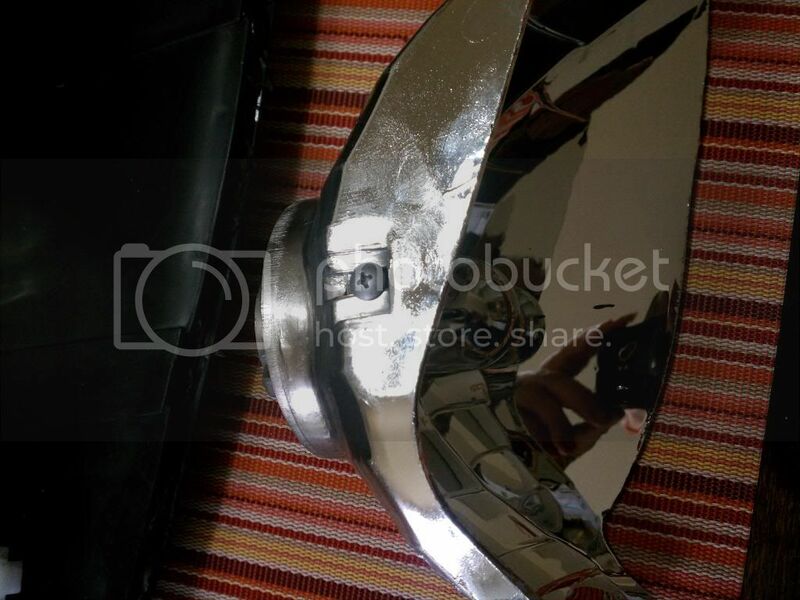 In this next picture you see the projector base on top of the reflector bowl. 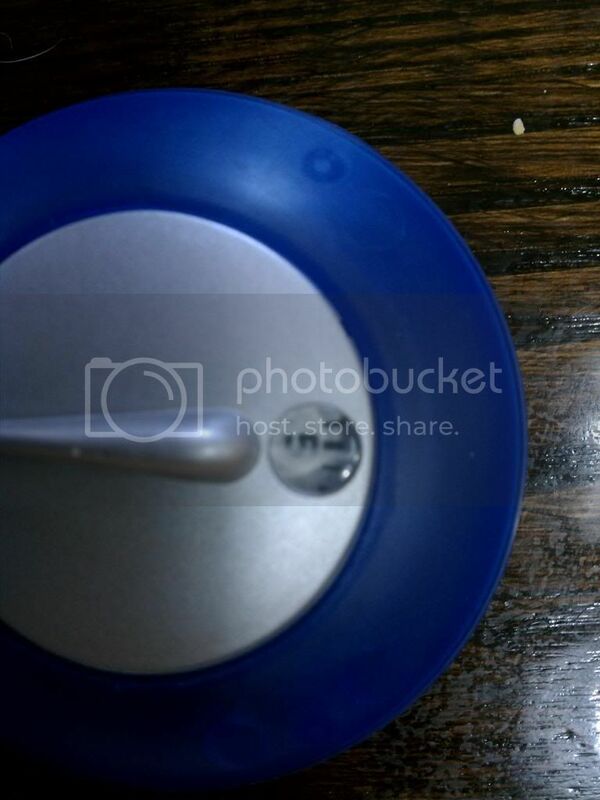 The threaded portion of the projector has to slide through the reflector bowl. Kind of like this… only from the front…. 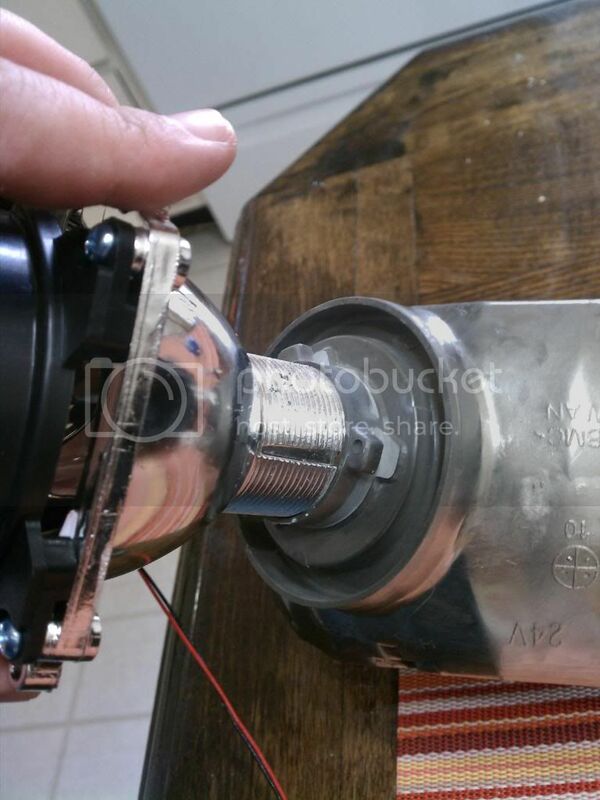 Using the Dremel with the sanding drum, slowly open the hole that your bulb goes through until it is wide enough for the projector to slide through. This is a trial and error process. Take your time. You can always grind a little more out, but it is a lot harder to replace material if you take out to much. I normally screw the projector in a little bit so it makes marks in the reflector bowl, then grind away the material using those marks as a guide. You want it to be just wide enough that you can slide the projector through without it hanging up or being too tight. Here is the underside. The lines you see are just to help me as I am cutting to keep it squared up to the direction that the projector is. And now your projector should fit nice into the reflector bowl. 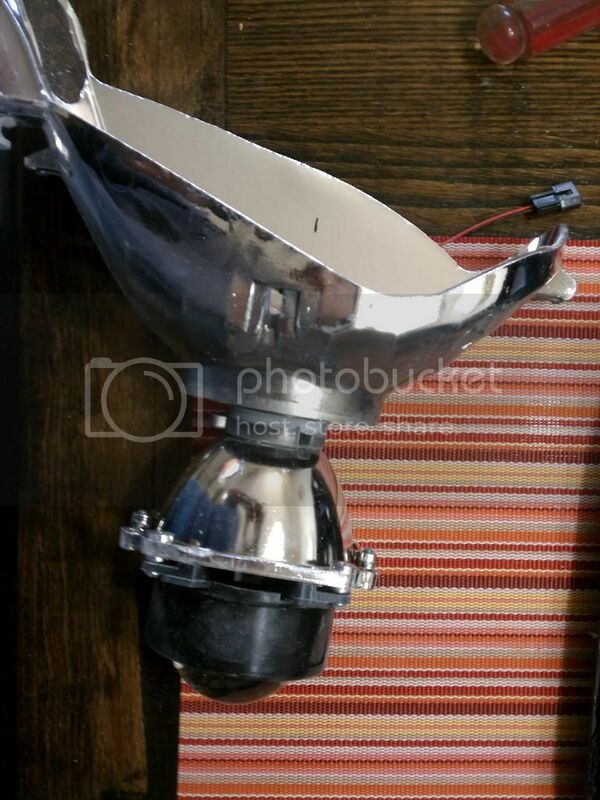 One issue I found at this point is that the back of the reflector where the stock bulb has a locking ring to hold it in, the housing is too long. You cannot thread the locking ring onto the projector’s threaded shaft. So I used my dremel to cut it down and then smoothed and evened it out on my bench sander. You need to keep this as straight and square as possible since the projectors locking ring butts up against it. 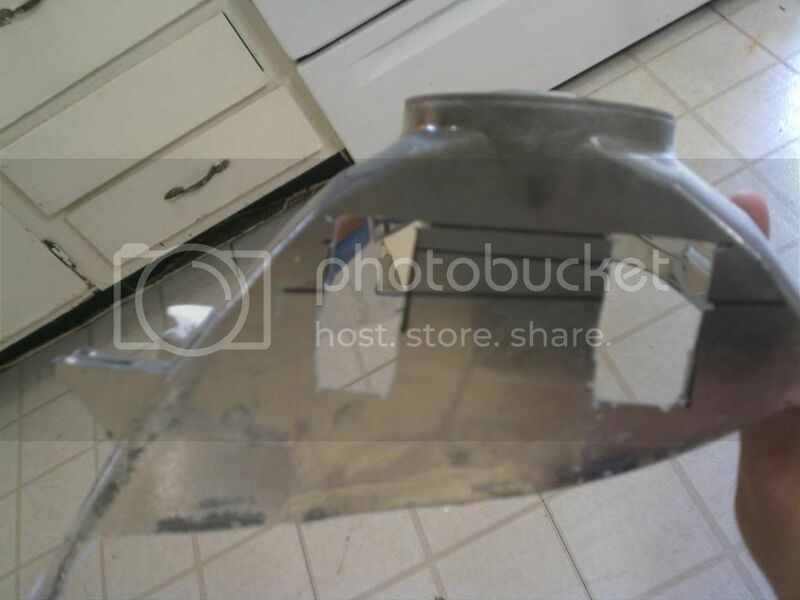 Ok, at this point we have a modified reflector bowl that we can attach our projector to. But with all these rings, rubber pieces, tabs and what not that were on the back of the projector, what order do we put things in? It should go projector, big white rubber ring, reflector bowl, metal plate with H4 tabs on it, large lock ring. That holds it securely into the reflector bowl. Snug everything down nice and tight. I use my Craftsman RoboGrip pliers, but a decent set of channel locks would actually probably be easier. You need to have at least 1/8 inch of threads showing so that you can thread on the last ring that will actually hold in the bulb. If there isn’t enough threads showing take the projector out and use the sander a bit more to lower the back. Now to make the shrouds to cover the projector… pretty simple actually. 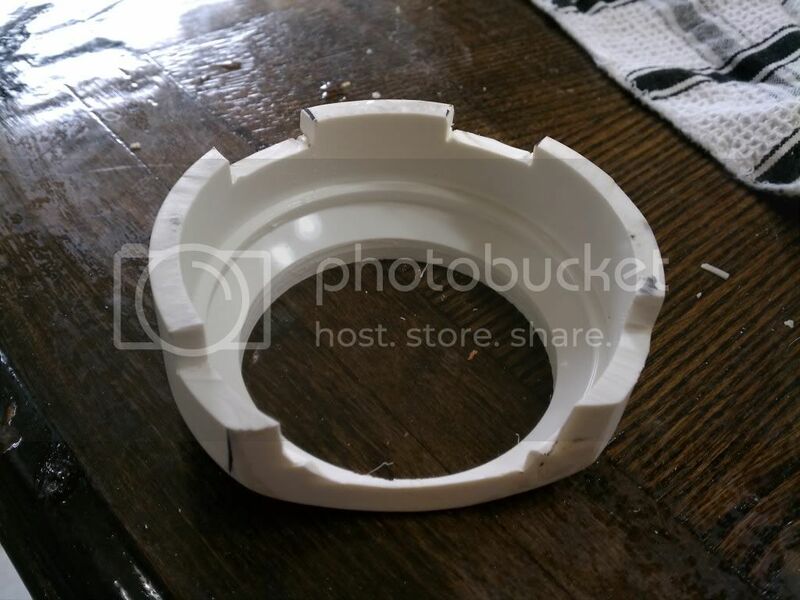 Start with a domed end cap for PVC pipe in 3” size. Using a drill and a hole saw that is 2 ½ cut a hole in the center of the dome. If your caps aren’t marked for center, just use a length of wire and wrap it around the outer edge of the cap and cut it so the ends were flush with each other. Now take the wire off, and fold it in half. At the end of the fold mark the wire I use my trusty Sharpie to mark the wire. Now re-wrap it around the cap and mark where the ends meet and where your halfway mark on the wire is. Turn the cap 90 degrees and re mark. Using a straight edge connect the dots making a + on top and that my friends is the center. Drill there. This hole is for the lens if your projector to stick through. In that picture you notice that one side is cut flat. 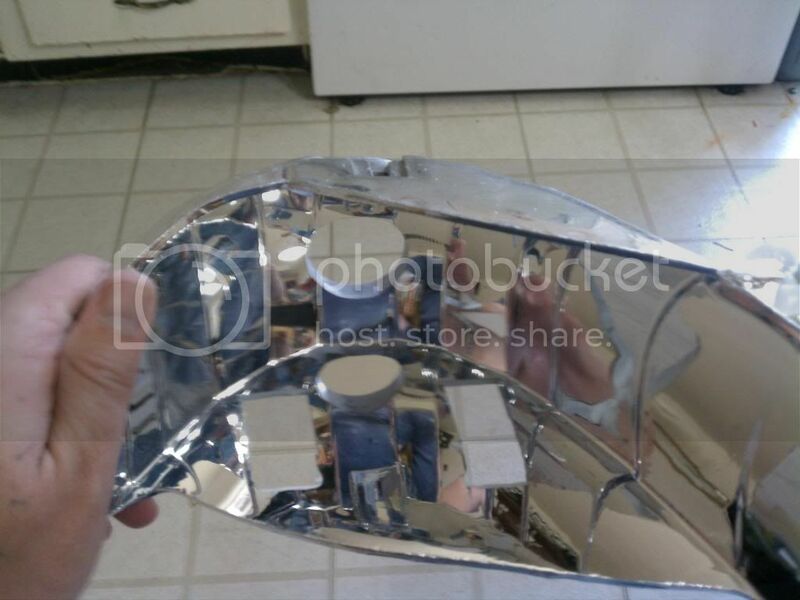 This is to allow it to sit flat in the bottom of the reflector bowl. i found a chop saw with a fine tooth blade works wonders for cutting this, just dont get your fingers in the way. 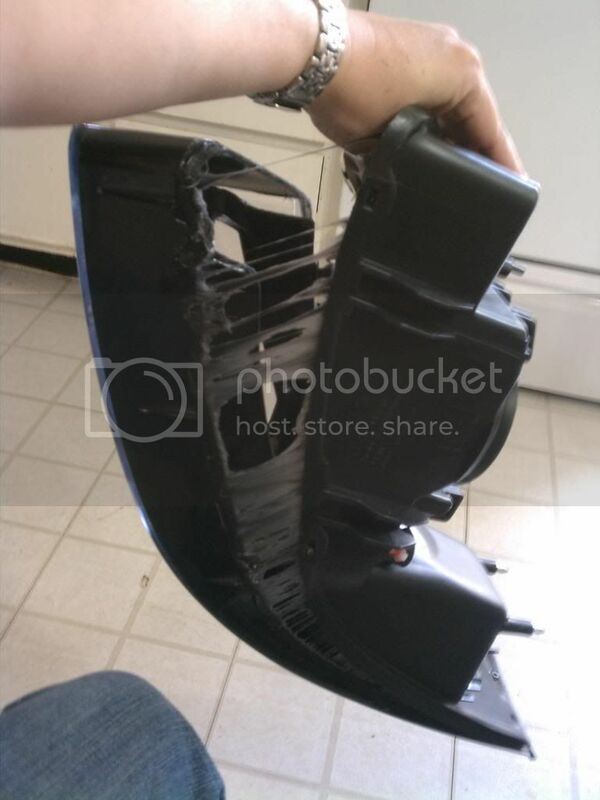 I found that the edges of the reflector bowl fits real nice on the control levers of my lawn mower. My wife on the other hand thought it was a stupid place to paint. Oh well. She never mows so she doesn’t get an opinion on this like she did the Oven. Once the paint dries you can go ahead and remount the projector. Remember to screw it in TIGHT! 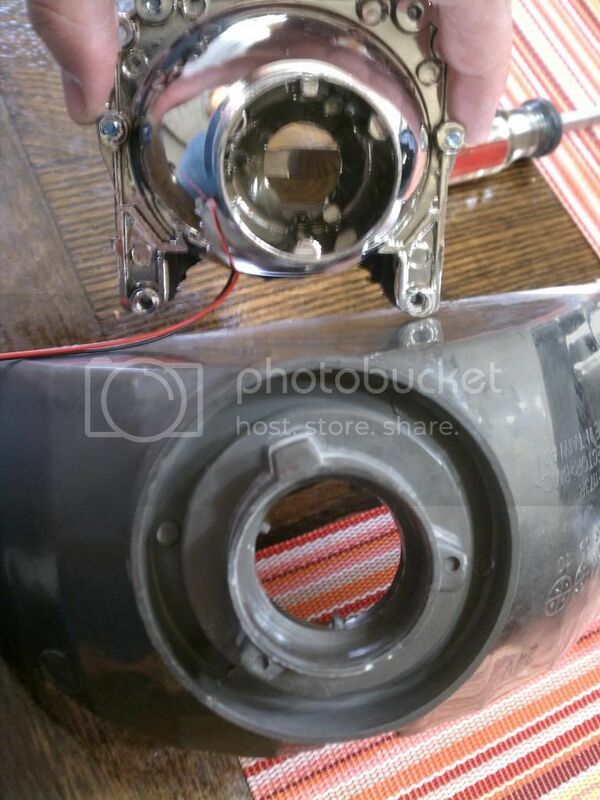 Now that your projector is mounted snap the reflector bowl back into the headlight housing. Go ahead now and build your second light. You’re going to need both for the next bits, and then your going to be done!! Now we get to start the fun part of leveling and aiming the lights. 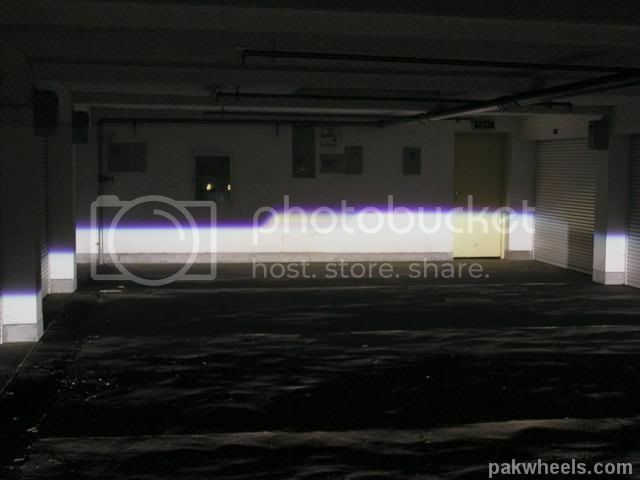 I like to do this in an underground parking garage at work. 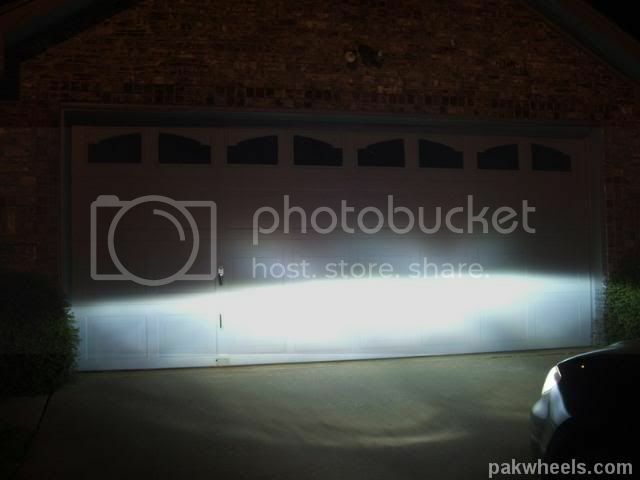 Since its underground it is kind of dark so the light pattern show up on the wall well, yet the garage is lit so I can see what I am doing when making my adjustments easily. Mount the lights onto your car. Pull your cars nose all the way up to the wall and turn on the lights. Using tape make and inverted “T” where the lights are on the wall. The vertical tape strip should be marking the vertical center of where the projector is, and the horizontal tape is marking the elevation the projector is at. Now measure down 3 or 4 inches and make a mark by each “T” on the wall. Connect the two marks with one big long LEVEL piece of tape. This is going to be the top of your cut off when we are done. Now back your car about 25 feet back from the wall. Take care that you don’t drift to the left or right from where your car was at the wall. This is another reason I do this in a parking garage. When you pull up to the wall try to get one of the seams in the floor to be lined up at the side of your tires. Then when you back up, keep the seam aligned with your tires. I’m sure as you backed up you noticed that the light is now showing you the cut off that projectors give you, and I’m sure that they moved on you. Using the headlights vertical adjustment, adjust it so that the “step” in the cut off is at the height of the horizontal tape line. We are just going for rough adjustment right now until we get them leveled… I’m assuming that the cutoffs for your lights are not perfectly level. Using your pliers grab one of the tabs on the H4 plate on the back of the projector and rotate it a bit at a time until the cut off is level on the wall. Do this for both lights. Adjust the height of the cut off so that the top part of the step is even with the horizontal tape line and even between BOTH lights. At this point we are not trying to totally aim the lights as things might change up a bit during final assembly ( Remember at this point the shrouds are not attached nor are the inner moldings and front outer lenses).Once they are level head back home and to your Oven. Your about to need it again. Now we get to mount the shrouds. Since I black out all the internals I just use a generous amount of black silicone to glue them in. Smoothing it out around the edges with my finger like you would a caulk line. The only edge I don’t use the silicone is the inner ring that goes around the lens. I just don’t want to take the risk of getting it on the lens, plus if they somehow get out of level I still want to be able to adjust them. Let the silicone cure completely. As in overnight, or two. As silicone cures it gives off a gas, and if you go on to the final steps and seal up your housings while it is still doing that you run the risk of etching the inside of the lens. 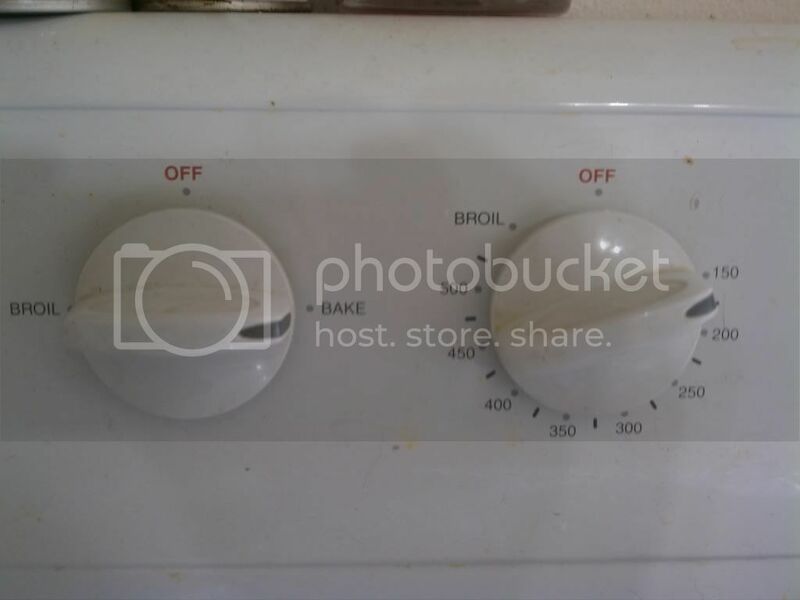 Now that you patiently waited for the silicone to fully cure, heat your oven to 150. 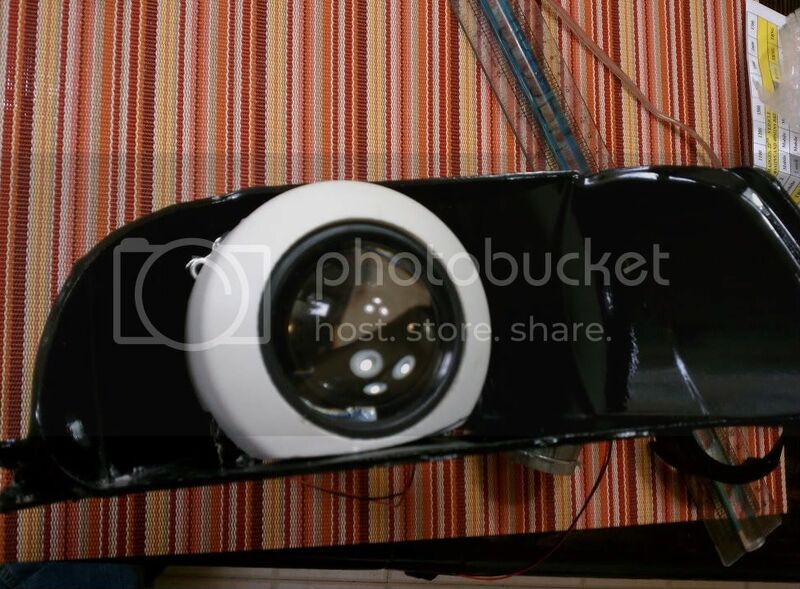 Put the front lens in to warm the glue a bit so you can pull the inner molding out of the lens. 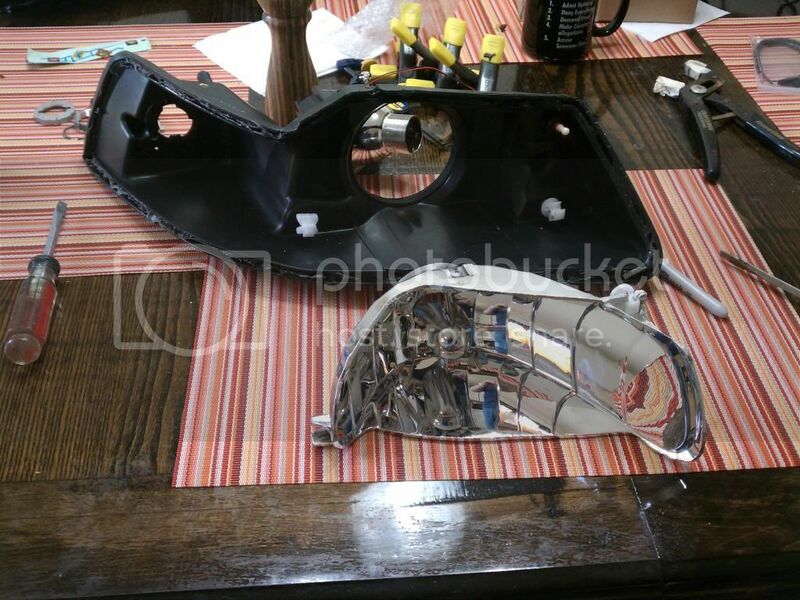 We are going to make sure there is clearance to fit it in with the projectors mounted in the housing. Toss the housing/reflector bowl/projector assembly in the over for a couple of minutes to heat up the glue. You need to do this since there are three tabs on the inner molding that needs to be able to fit into the slots on the housing. Line the turn signal pocket up with its spot in the housing and then press the tabs into their spots on the housing. Watch the bottom of it carefully. It will probably hit the shroud on the projector a little bit. Mark it with a sharpie or grease pencil and then slowly grind it away with your dremel until it barely clears the shroud. 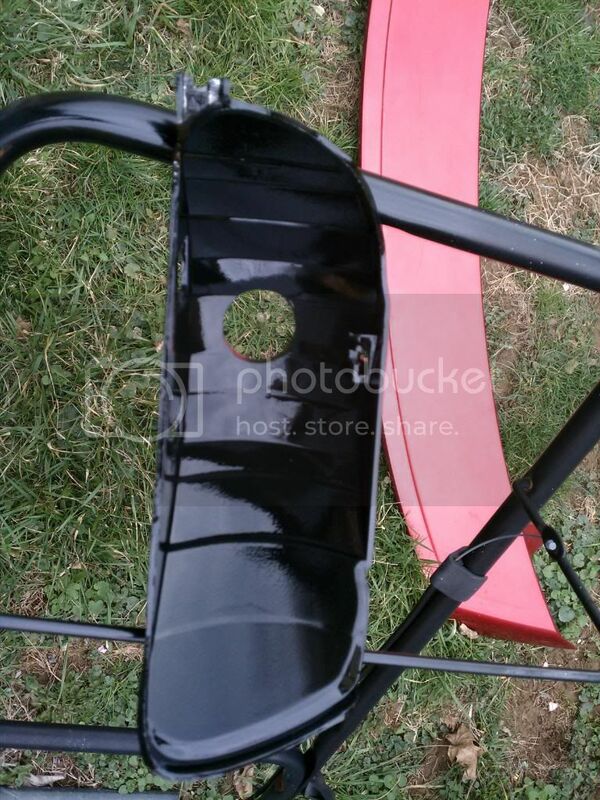 You don’t want a big gap or it will look unfinished and not so good, yet at the same time there needs to be some space or you will not be able to adjust the aim as the shroud will be hitting the inner molding. When you finally get it to fit right, with the tabs pressed all the way into their slots and you’re happy with it, put the housing back into the oven for 5 minutes to get the glue good and soft. We are now going to be closing up the lights. I normally start with the same corner that I started taking them apart at, the upper inner corner. put the housing straight into the lens and using your pliers slowly pinch the lens on. 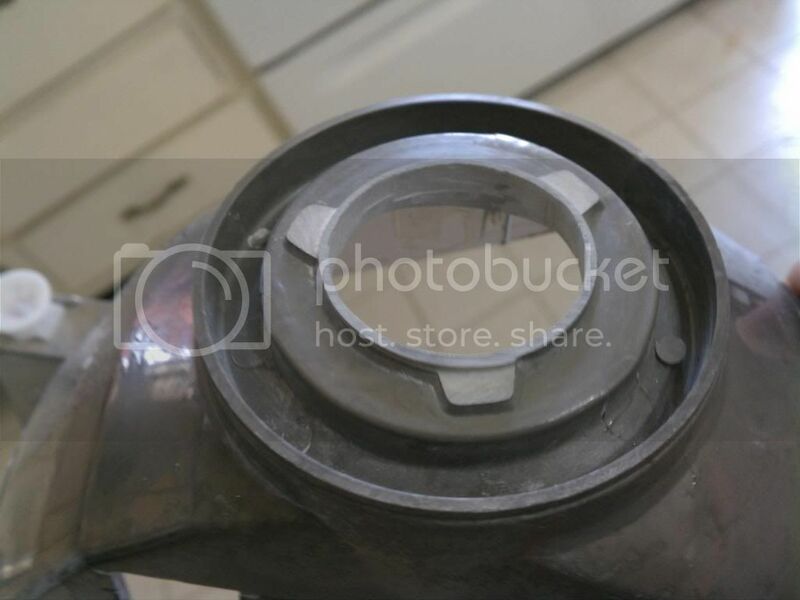 There is a lip on both the housing and the lens that you can grab onto to d this. slow even pressure is the key here. Don't try to just squeeze it tight in the first shot. Go slow and you will have better more even luck with it. Once you get the top done put the clip back on and a couple clamps to help hold it tight as you work the bottom. Now re-mount them on your car and go back and check the aiming. You want the center of the step centered in front of the headlight so that over distance it is not shooting sideways. Also make sure the elevation is good. I normally set mine so the TOP part of the step is about 2 inches below the horizontal part of the "T"'s you made earlier. this way the light is going almost straight forward, yet is aimed down just a bit so that it doesn't blind oncoming traffic. Congratulations, you now have a set of proper HID projectors. enjoy the light output that is usable and best of all, safe for other motorists. Last edited by weems; February 7th, 2012 at 05:09 PM.